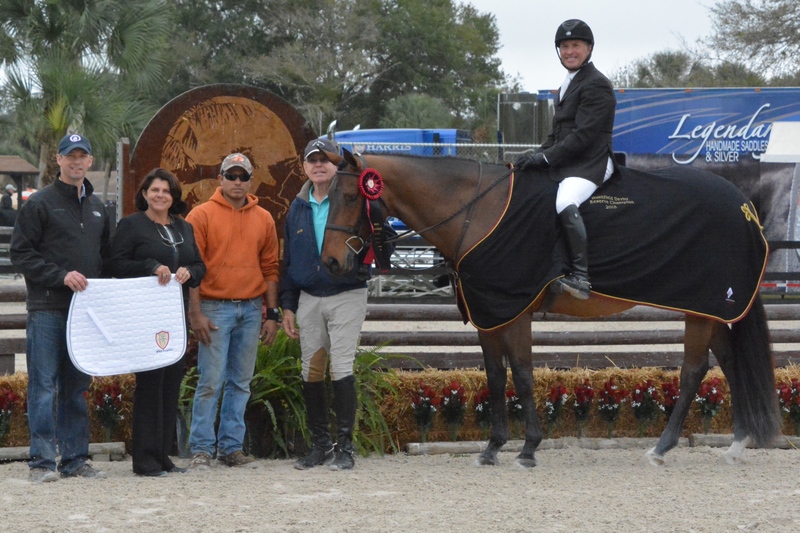 Venice, FL - January 8, 2016 – The NQHL Huntfield Derby Finals were graciously hosted at Kim and Clay Farrell’s Fox Lea Farm in Venice, Florida. The prestigious event was well sponsored and included the Open Artisan Huntfield Plastilite – Low Derby Finals and the Open Butet Huntfield Vargo Companies Derby Finals on Thursday. Each section included awards for the top Non-Pro riders as well. The Vargo Companies Draw Party and BBQ took place Wednesday evening and an Exhibitor’s Breakfast Thursday morning sponsored by Twilight Farms and Merry Sharp and Dutch Marrow topped off the event. 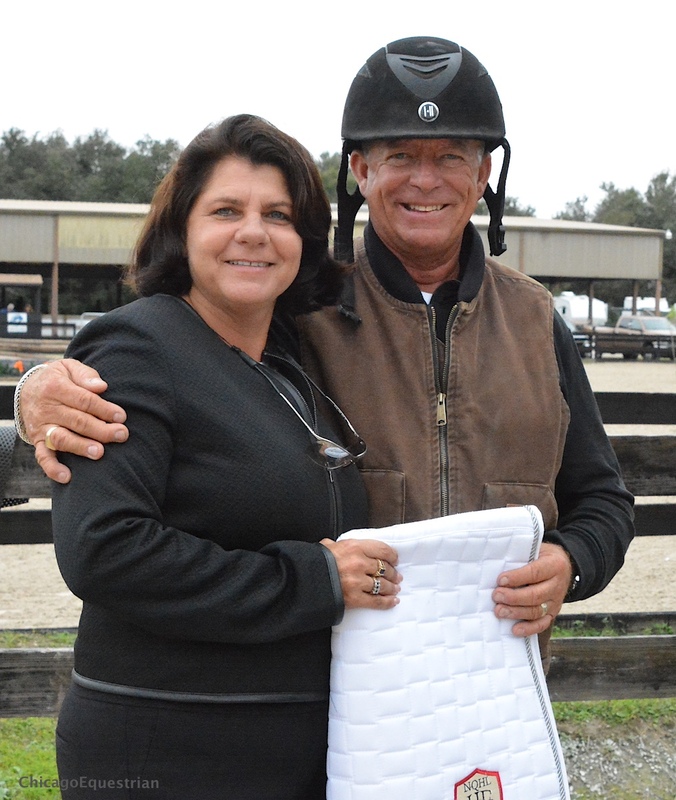 David Warner, Frankfurt, KY, designed an attractive and inviting course to test the horse and rider combinations so judges Jim Giblin, Tampa, FL, and Mindy Coleman, College Grove, TN, could determine the winners. The track had beautifully decorated option jumps and plenty of handy options for riders to choose from when the pressure was on. In the High Derby, riders set the pace with some great scores in the 80’s, leaving Linda Crothers and Go Big Sky, owned by Rodger Call, at the top of the pack after the first round with the top score of 88. Also in the top of the pack was Jessica Johnson with Kelsey Moody’s Whenitallgoessouth with an 83, Hannah Elizabeth Bedwell with Do You Have The Magic with an 81 and Lanie DeBoer and Lori Bucholz’s Larks Happy Days with an 80. Lanie DeBoer and Larks Happy Days. Photo Chicago Equestrian. In the handy round, riders upped the ante with blazing scores. DeBoer moved up in the standings with Regal Tequila adding an 88 to her 76 but had a heartbreaking rail at the last fence with Larks Happy Days. 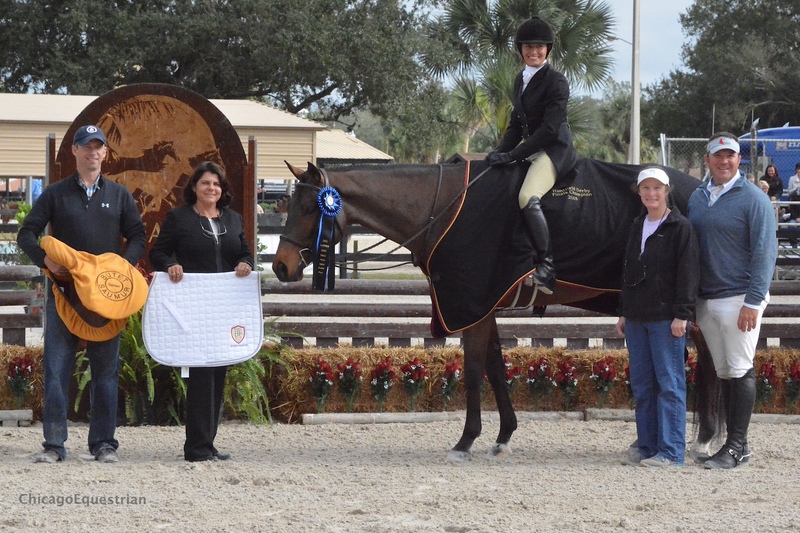 Bedwell rode to a 94.5 giving her the lead until Crothers knocked it out of the park with a 97 for the championship. Crothers of Springtown, TX, also won the first Huntfield Derby Finals with Go Big Sky in 2012. From the beginning of the series, the duo has been tough competition in the derbies. 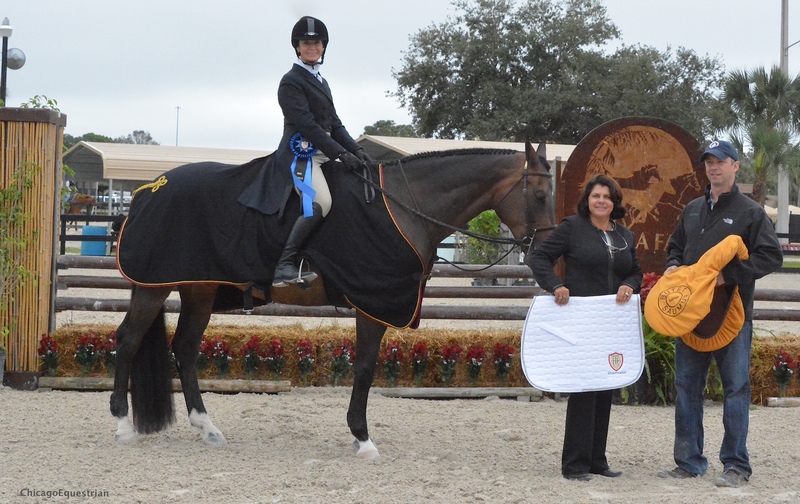 The pair had a spectacular season including adding AQHA World Championship titles in Senior Working Hunter and Senior Hunter Hack to their lengthy resume. Owner Rodger Call, 73, earned himself the Amateur Select Hunter Hack Championship at the Quarter Horse Congress this past year as well. Call and the 14-year-old gray he calls Marcus, don't let age slow them down. In an interview at the world show, Call and Crothers said the horse is like a fine wine and just gets better with age. His performance in the derby finals was just more proof. Bedwell, 22, of Ball Ground, GA, took the championship for the non-pro’s as well as collecting ribbons in the Open section. She trains with Julie Moore, David Miller and Scott Jones, as it takes a village, she jokes. Bedwell has had Do You Have The Magic, aka Jackson, since he was three-years-old and he is now nine. Tim Roper's Only Royal Blue and Samantha Roper took the Reserve Champion spot in the High Non-Pro Derby. Photo Chicago Equestrian. In the Low Derby it was the battle of the Davids. David Miller of Boerne, TX, and The Fire Escape lead the pack after the first round with an 84 but David Connors, Ocala, FL, and Signed in St Louis was right on his tail with an 83. 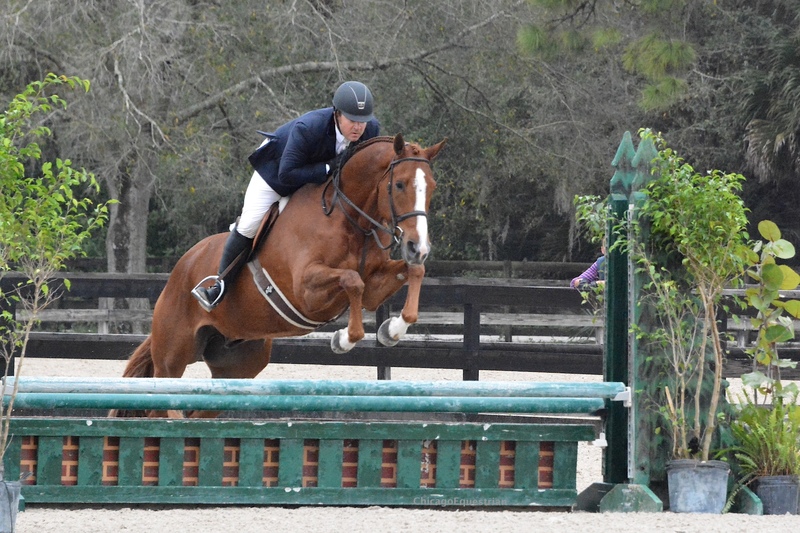 Connors put the pressure on, making a tight inside turn to a single oxer that not many had tried to do to gain points, but in the end it was Miller who received a handy score of 84 with his smooth and handy round to clinch the win. Miller’s mount, The Fire Escape, has had a stellar career and is only six-years-old. He was the Masters 2-Year-Old Under Saddle Champion, won a circuit championship at every major show last year, he won the Progressive, Green and Junior Working Hunters at the 2015 QH Congress, the NSBA World Championships and won the AQHA World Championships in Junior Working Hunter, Reserve World Champion in the Progressive Working Hunters and now the Low Derby Championship. David Connors and Bill Ellis accept the award for their second place finish in the Open Low Derby with Signed in St. Louis. Photo Chicago Equestrian. 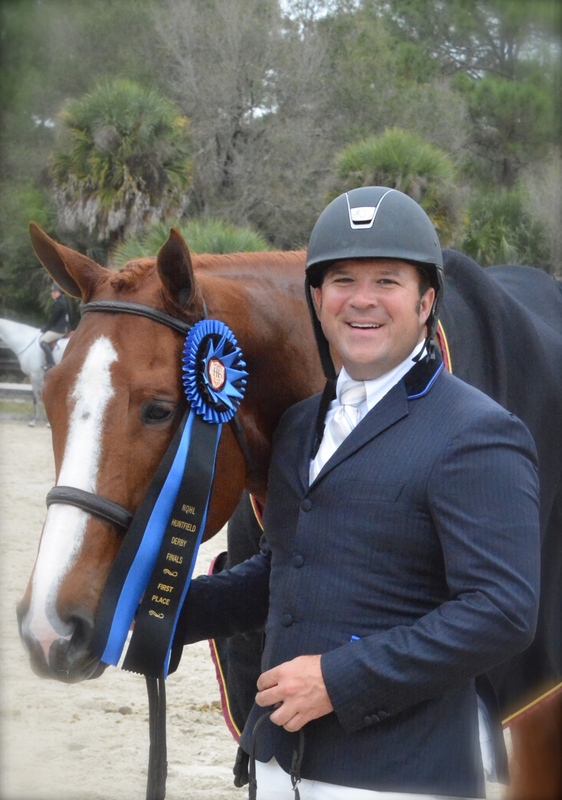 Second place finisher Connors and co-trainer Bill Ellis, also show at USEF rated hunter shows as does DeBoer, who won the Quarter Horse Incentive Award at the USHJA Pre-Green Championships in 2015. 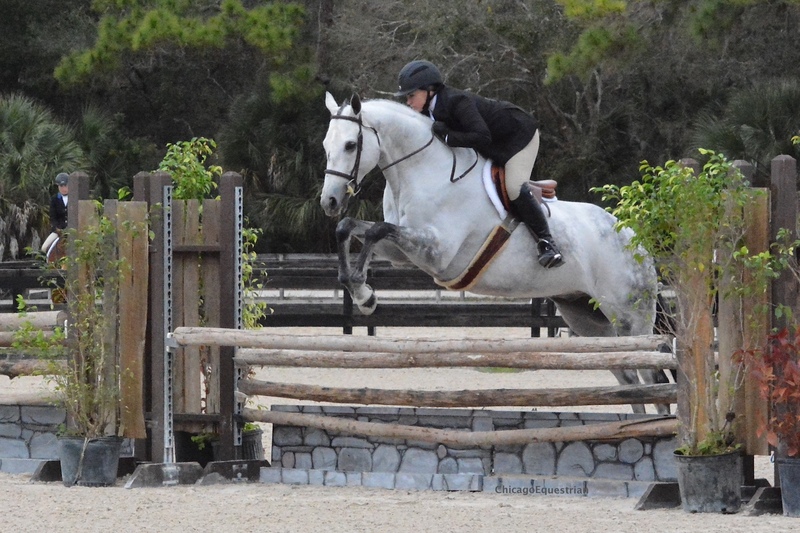 “We’re lucky that the horses we have as quarter horses can show very competitively at the lower levels of the regular USEF shows,” said trainer Bill Ellis. Annette Fowler, Azle, TX, and Malibu Molly took the third place spot in the Low Open section and the Championship in the Low Non-Pro Huntfield Derby. 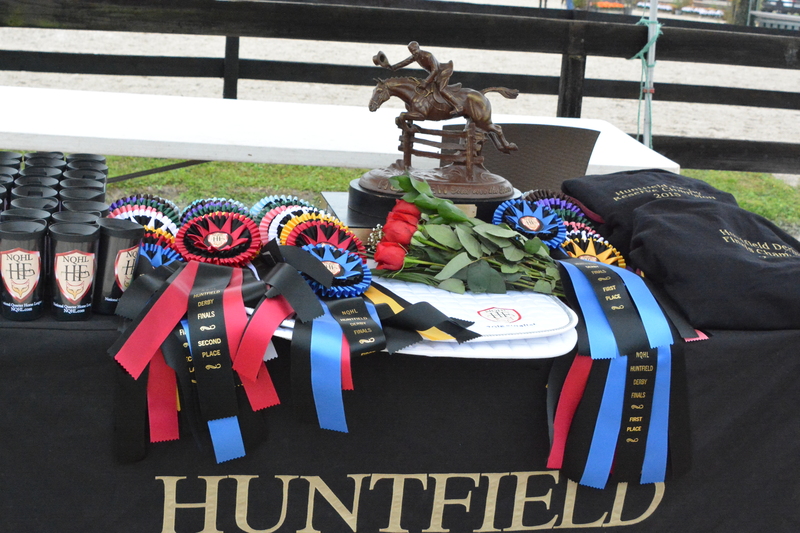 Gorgeous awards for the two derbies included saddle pads, cups, monogrammed coolers, Butet Saddles, Beval Artisan Saddles, One K Helmets and $7500 in prize money, thanks to the support of many great sponsors. The handsome trophy came from Joe Darby’s collection and was sponsored by Ellis and Connors. Joe Darby was an avid horseman, a member of the National Show Hunter Hall of Fame, and one of the nation’s best hunter riders and trainers. He passed away last year and over the years, had numerous national champions and rode to tricolors at some of the finest horse shows in the country. He officiated as a top rated hunter judge at the best shows across the nation as is listed on the honor roll of distinguished officials. It is quite special to have one of his trophies as part of the Huntfield Derby Finals. The complete results are listed below. The NQHL continues to grow the derby series within the quarter horse discipline. They encourage horse shows to host the derbies and are grateful to the generous sponsors who support the events. The NQHL is grateful to Clay and Kim Farrell for hosting the event at their beautiful Fox Lea Farm and hope to see more derbies there in the future. The group is working to offer more prize money, more press and more prestige to help the number of participants climb. For more information on these special classes, visit the NQHL website at foxleafarm.com/NQHL. 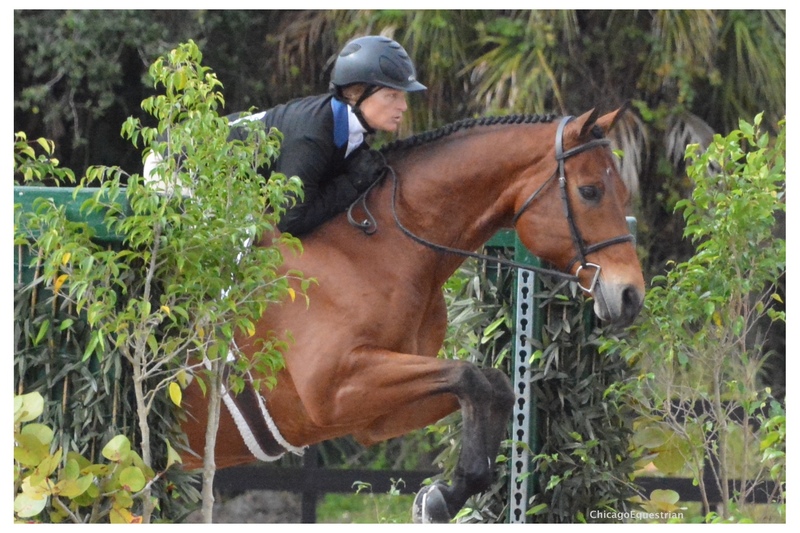 For more photos visit Chicago Equestrian on Facebook.